I knew I’d like it, and recently read it all to confirm that, and it was great. It was just a really great pick-me-up. 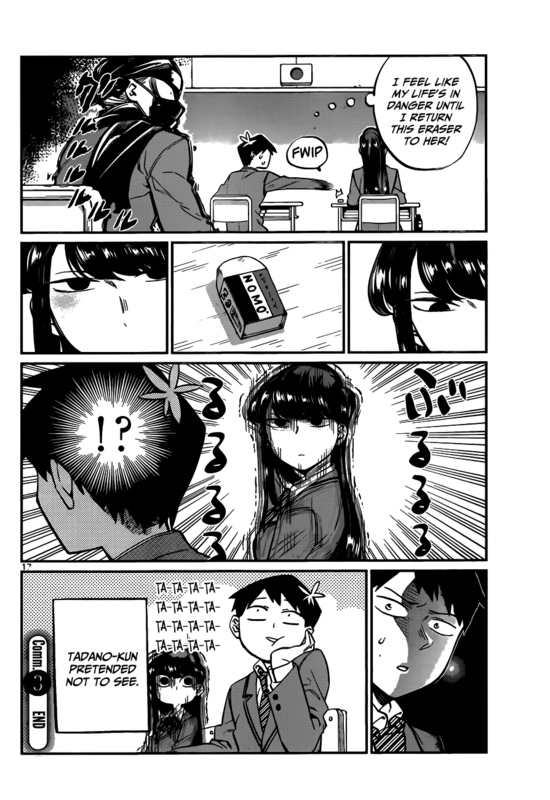 This manga is Komi-san wa Komyushou Desu. (古見さんは、コミュ症です。, Miss Komi has a Communication Disease.) by Oda Tomohito (オダトモヒト), and it’s a comedy series with extremely light romance (I have some things to say about this) that is also kind of secretly a yonkoma series (it doesn’t seem like it at first, but most pages are 4 panels, though it’s strange…aside from not strictly being 4-koma, the panels are often varying rather than consistent sizes and sometimes even shapes, and panels sometimes get split up). The title actually isn’t quite “has a Communication Disease”, but that’s probably for the best since the translation for “komyushou” is difficult. “Komyushou” is a Japanese word for a condition of having trouble with speaking/dealing with new people. Basically, Bocchi from Hitoribocchi no OO Seikatsu has it. So does Komi. 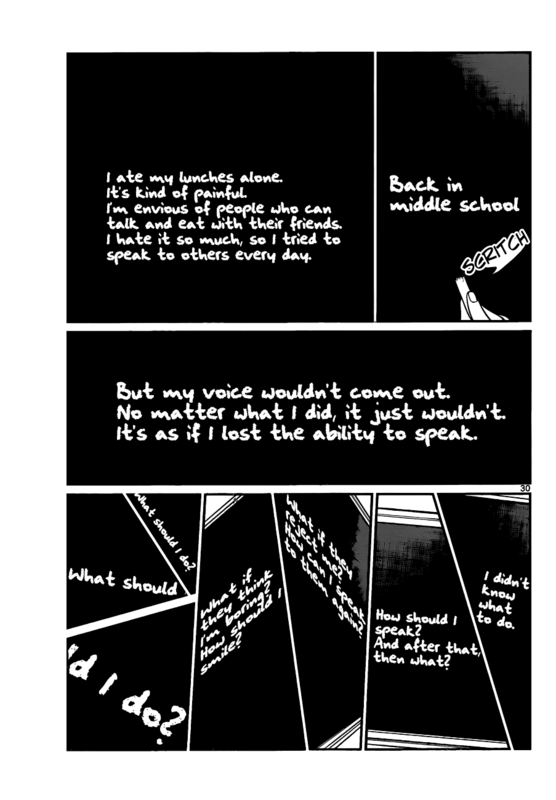 “Miss Komi has Communication Disorder” doesn’t sound as good in English, and “is bad at Speaking/Bad at Communicating” isn’t QUITE right. This series feels kind of similar to Kaguya Wants to be Confessed To to me, as well as Jitsu Wa Watashi Wa. I should say that I dislike JWWW, a lot, and think that basically this is a “similar idea, much better execution” situation (an opinion for which I’m sure people will be upset, as quite a few like JWWW). Also, although the two titular characters are similar, I do not think this series is similar to Hitoribocchi. Anyway, comparing series isn’t the only way to sell something, so let’s get into the meat of this darling title. This is a thoroughly fun, rather relatable, highly amusing and light read that most people ought to check out. 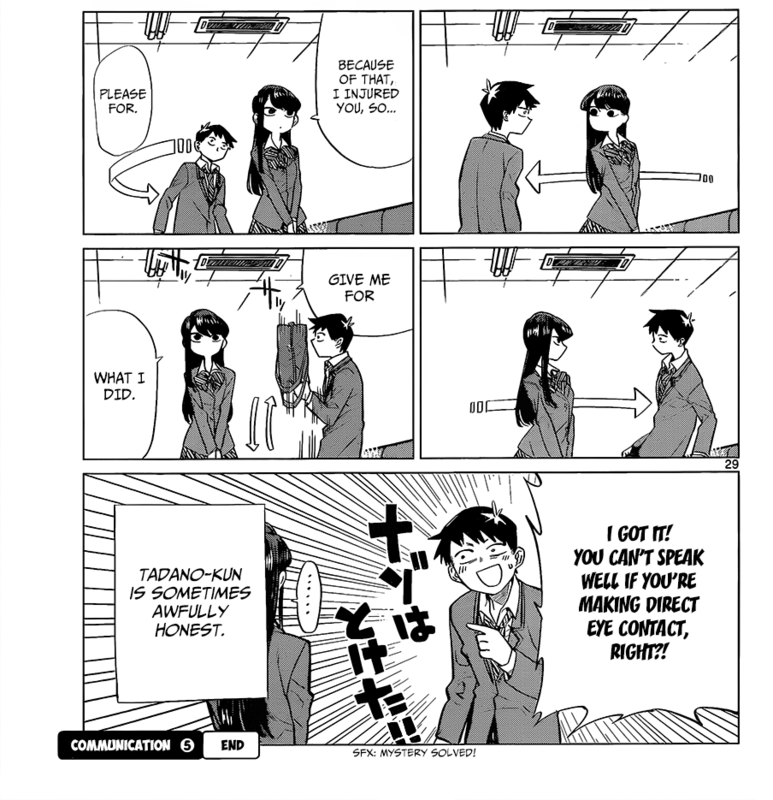 Komi-san started out as a one-shot. Okay, no big deal, that’s normal, but in this case the one-shot is…notably different, I guess. This isn’t like Nisekoi where the one-shot was miles better and also way different; actually I think that the series improved on the one-shot in many good ways, but…the one-shot is good. Very good, really. So step one is, where do I (or you) start? Read the one-shot? I read the one-shot first and found it interesting how things changed with the serialization, but the one-shot might alter your perceptions. 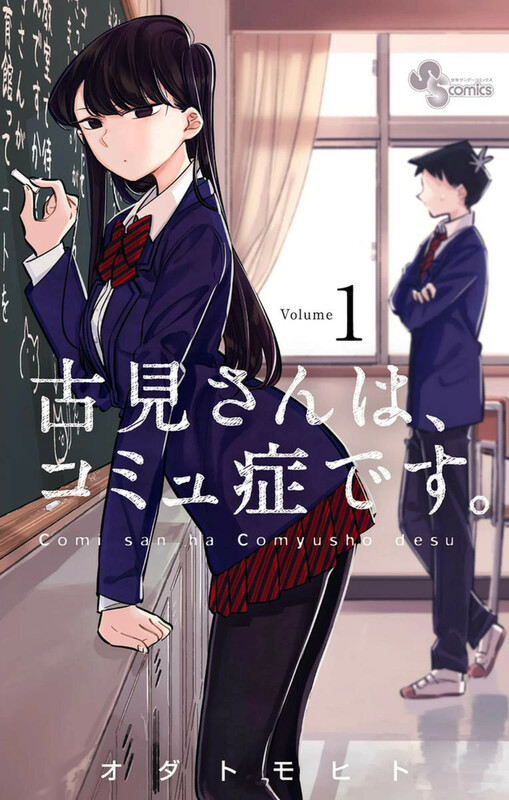 See, in it the premise is similar… There is a tall and beautiful high school girl named Komi Shouko who freezes up upon being spoken to, and tends to fixedly stare at a person in their eyes without answering them (intimidating). 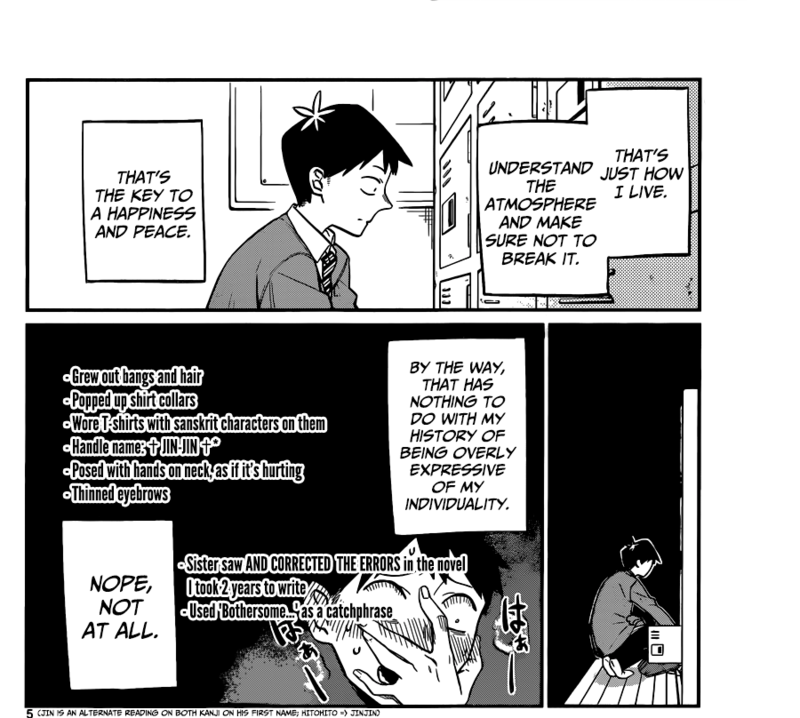 A subtle but significant difference is that the main character/protagonist, Tadano Hitohito describes himself as an acquaintance of hers, who is helping her to get over her social anxiety. There’s also a not at all subtle hint at romance. Most importantly, these are the only two characters in the one-shot. Still, the one-shot has the same goofy atmosphere (I’ll get more into that later), the same sense of humor, and Komi is about the same. Tadano does change a little in the main series, though, in a good way. So, let’s talk about the serialization already. 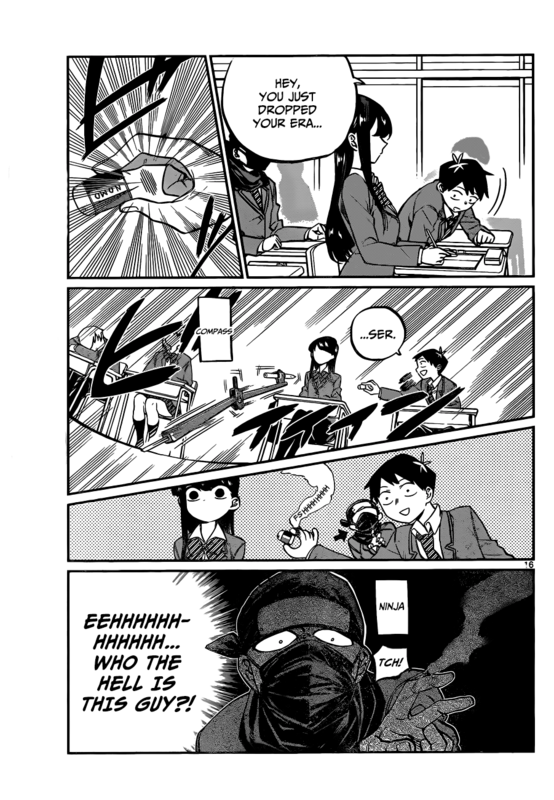 So the real premise of Komi-san wa Komyushou Desu. 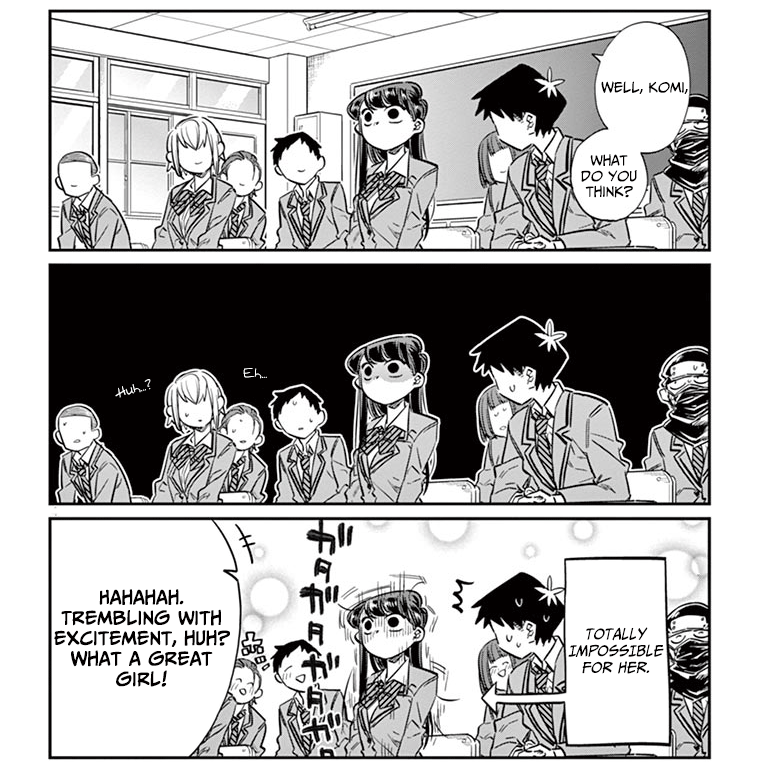 is that the titular Komi wants friends and wants to get over her problems. Adding in a slew of different characters is a very smart idea, since this way the series can avoid running out of jokes, and the characters added are all quite fun. 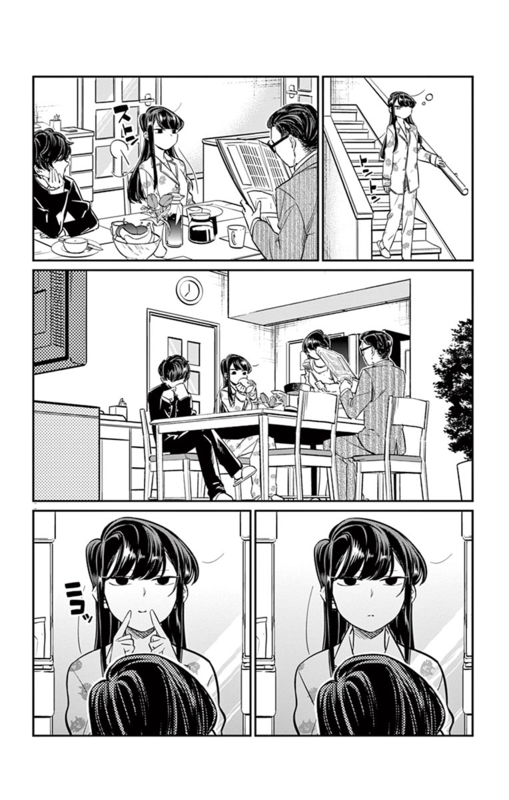 As for Komi, she has some typical “beautiful girl” qualities at a glance: gorgeous, seemingly graceful, seemingly perfect, but we quickly learn that Komi is supremely normal, her crippling social anxiety aside. She sits next to the MC, Tadano, in class and on the first day of school notices that her proximity to him has earned the poor boy a foul reputation. 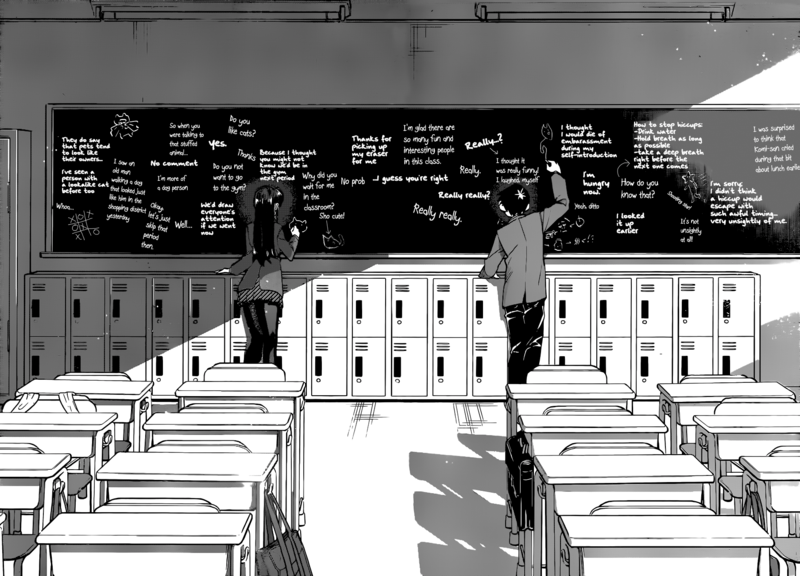 What follows him being accidentally knocked out by his excited classmates who literally worship Komi is that he wakes up at the tail end of lunch, alone with Komi in the classroom. They then share a super touching scene that results in the first page of this article, and they become friends, not acquaintances. I’ll talk a bit about Tadano, now, I guess! Even in the one-shot I detected that Tadano wasn’t just a completely “normal” main character, and I noticed that because he doesn’t know when to shut up. Honestly, he’s a huge dork. I’d describe him as “wanting to be the normal MC kind of guy” except he’s actually kind of an awkward weirdo who’s more friendly and outgoing than you’d expect. He really only ends up friendless at the start of the series due to circumstance, and he hits it off well with Komi once he knows what her deal is. So basically, I like him, which is a good step 1. He’s also so much less irritating in regards to what romance hints are in this series than he could be. In fact he’s not irritating at all. If anything, in them he’s rather adorable. This scene is particularly adorable, also. They’re all quite great. My favorite character so far gets two image examples. She is most rad. As I mentioned earlier, there’s a goofy atmosphere to Komi-san. Try paying attention to background characters in any scene, they’re usually doing something stupid. Foreground, too, they tend to be very bizarre. 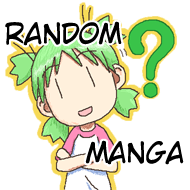 It makes the whole thing lighthearted but stays away from being too wacky a la JWWW or Prunus Girl (which also focused on “a character beloved by boys and girls that the whole school obsesses over”, but was super annoying about it). 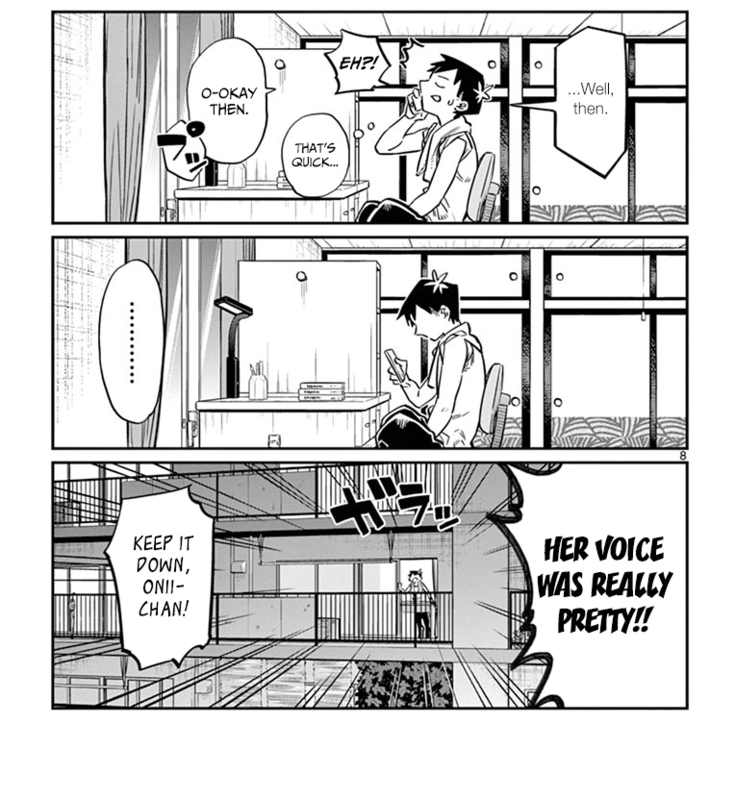 Also, the most significant character after Komi and Tadano is a crossdressing…classmate named Osana Najimi (literally “Childhood Friend”), who is friends with everyone and yet also a massive troll. The main event is, of course, Komi-san. She’s easily my second favorite (my favorite is Yadano Makeru (pun: “I don’t like losing”) because I like characters like her), and there are many reasons for why she is lovable. She’s not a simple “joke” character, thankfully, and it’s nice how she really tries her best. Her oddness and freezing up is genuinely quite funny too. Her wide-eyed stare that she wears for most of the series is priceless, and she also sometimes looks like a cat. 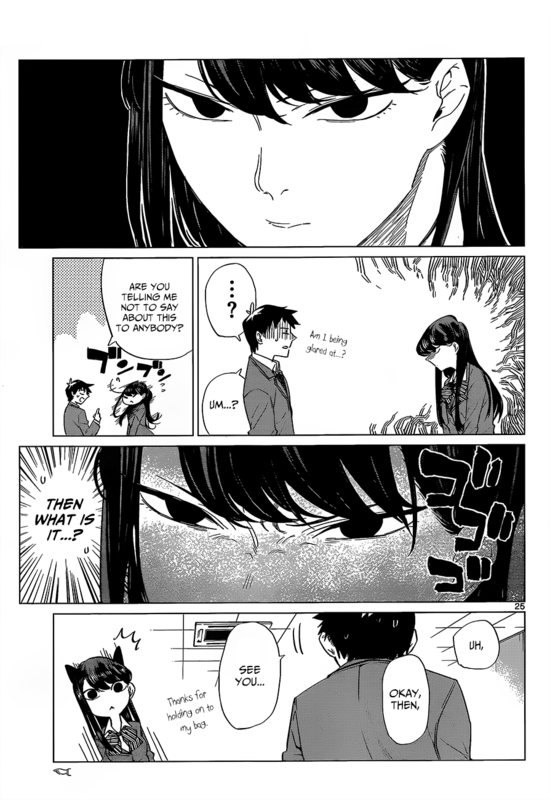 All in all, Komi Shouko is a good girl. Speaking of her eyes and cat-ness, though, I sure love the art in this series. It’s almost…cartoonish? Mouths will be out of the appropriate place, expressions are crazy, and it feels at once both loose and carefully pretty (it’s EXTREMELY pretty when Komi isn’t in her common ͜͡● ͜͡● form). I don’t mention art often, so you ought to know it means a lot that I’m talking about it. Also Komi is genuinely pitiable, which is important. Anyway, I can’t say much more! 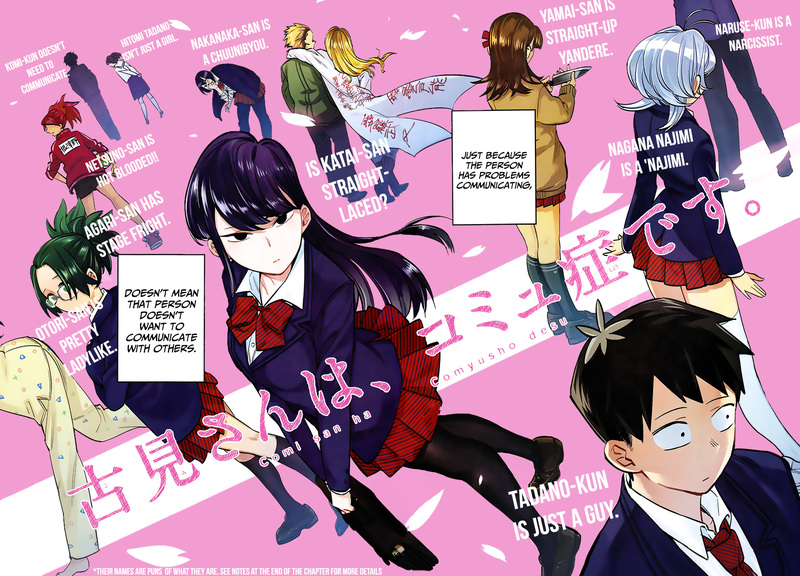 The general way the series goes is that Komi tries to get over her anxiety by participating in activities, a new character is introduced/made into a friend, or a character steals the spotlight. The school is actually full of strange people, apparently, so I’m looking forward to the rest we meet. I laugh a lot while reading this, and I don’t mind the very slow burn and rarely entertained romance either. I think any praise this one gets is most deserved. It’s a new favorite of mine, and I highly recommend it. I also really like that although Komi’s “perfection” and “beauty” are regularly praised by her dumb classmates, her “positive” points don’t feel harped on and thus she never feels unrealistic or unrelatable, unlike the majority of these sorts of characters. I hope I got across how I actually love this series… I don’t want to show off everything about it, but it really brings such a smile to my face. Please do read it! 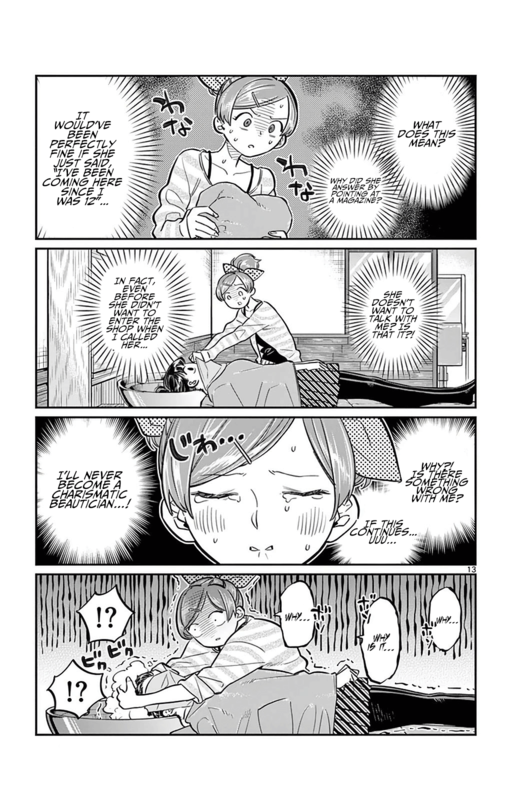 You may purchase Komi-san wa Komyushou Desu. from CDJapan, honto (guide), or ebookjapan. You may also follow the author on twitter @aaaa_aa23 (what’s with that handle!?). And by the way, the series could use a translator. If you want to help out, consult this image. For a rather short review, this took me quite a while to write… Huh. Well anyways, I have ideas about what I want to review next time, but we’ll see how it goes. Thanks for reading, readers. Later! Anywho, nice review as always; I’ll be giving this a look over the weekend, now that I’ve caught up with reading Straighten Up!. Enjoy it! It’s a very quick read, so you’ll probably be done with the translated chapters quickly. They’re “behind”, but rather it’s just that the scanlation team decided to go with tank releases instead of magazine raws, so the lates chapter is 60 while the last one translated is 21. Still, it’s great stuff and should give you at least a few hours of laughs. Speaking of Straighten Up, the translators are nearing the end of that series. Still miffed it’s gone. Anyway, happy you enjoyed it enough to catch up. I actually do that deliberately for the latest review as a means of always showing one full example of the style of write-up you can find here. I remember I read some chapter of this series and kinda dropped it for no particular reason since I liked it. This reminds me that I should return to it. Yeah, you oughtta. It’s just good. Reblogged this on Si tuviera un plan. I think it’s just a style choice. “Narration” itself is a deliberate choice for some comedy, you either like it or you don’t. Didn’t have a chance to read this review sooner (saw your reply a few weeks ago), but its pretty good. I like how you brought up the oneshot, I hope if anybody does reviews later on they’ll also mention it in some capacity. So, about how far along was the translation at the time you wrote this and what are your thoughts on the manga now when compared to how you felt at the time of this post? Looking into it, the translation had stopped in December of 2016 and probably not coincidentally who knows (?? ?I’ve prompted people to restart translations before???) it resumed five days after my review in February. I had read up to chapter 21 in English, but had read everything available in Japanese, so up to chapter to/around chapter 50, very rough estimate. The manga is still quite good but I have a slightly weird complaint in that Tadano’s a bit too perfect nowadays. He always says and does the right thing, whereas before he always felt like a goofball who still managed to have a good enough heart to manage the right thing. 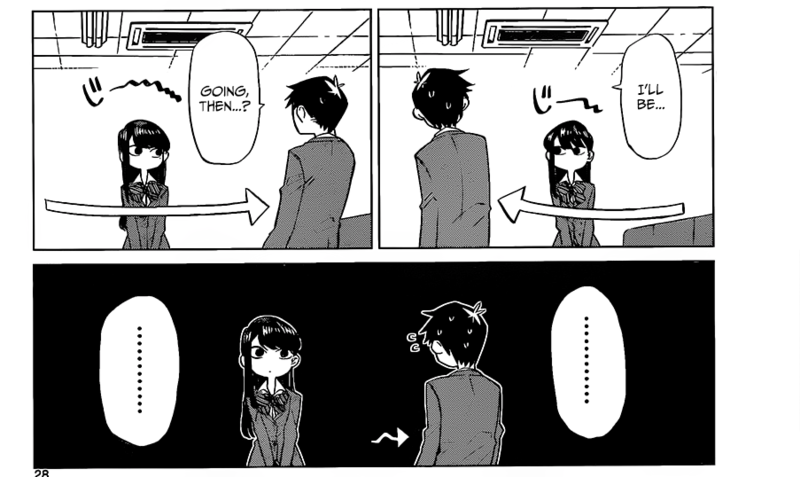 Sure, character development, but when he starts getting more girls than Komi interested in him, I start getting worried (even if Manbagi is totally great). 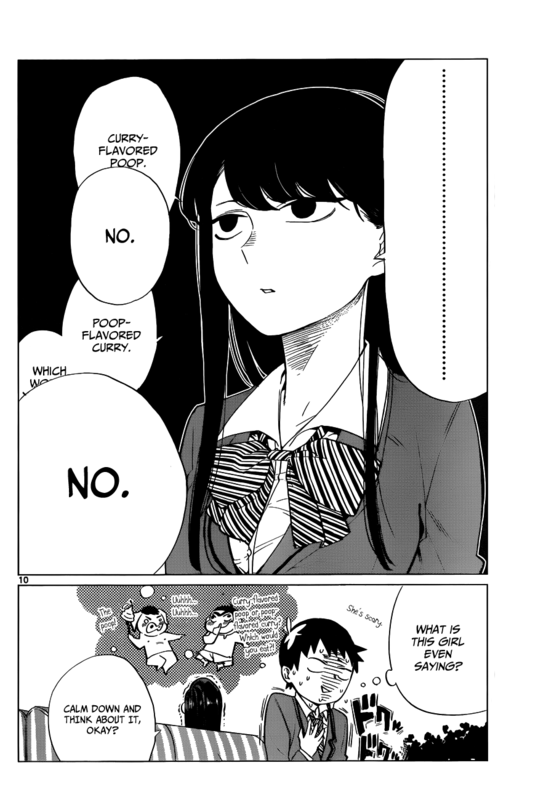 Komi herself is excellent as ever, Najimi needs more paneltime, and generally speaking it’s still very funny, but I should probably do an addendum on it at some point since it’s changed quite a lot since I wrote this. The younger siblings of the main characters are the best. The younger sister is especially surprisingly great.